The North Vista trail is located in the North Rim Section of the Black Canyon of the Gunnison National Park near Crawford, Colorado. 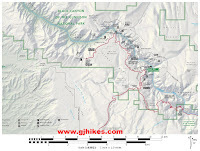 This out and back hike leads from the trailhead at the North Rim Ranger Station to its highest point on Green Mountain. Along the way the trail passes several scenic overlooks including the very popular Exclamation Point. The trailhead is near the restroom at the north end of the parking area of the Ranger Station. The North Rim is a little off the beaten path. To get there find your way to Crawford, Colorado and head south on Highway 92. Take the first right just after the Crawford Reservoir on the Black Canyon Road. There is a sign for the North Rim of the Black Canyon. The last 4 miles or so is unpaved but well oiled so it is almost like driving on a paved road. The roads within the North Rim Section of the park are otherwise gravel. The entire length of the trail is well traveled making route finding an easy task. Just under 3/4 of a mile there is a turnoff to a primitive overlook that has a sign post without a sign. One gets the impression that either maintenance is falling behind or perhaps the Park Service is no longer encouraging the use of this particular overlook. The overlook doesn't have an official observation point or a guardrail that allows you to get close to the edge like some of the other overlooks in the park. The next overlook comes up about 500 feet down the trail from the last. This overlook has a more official sign. 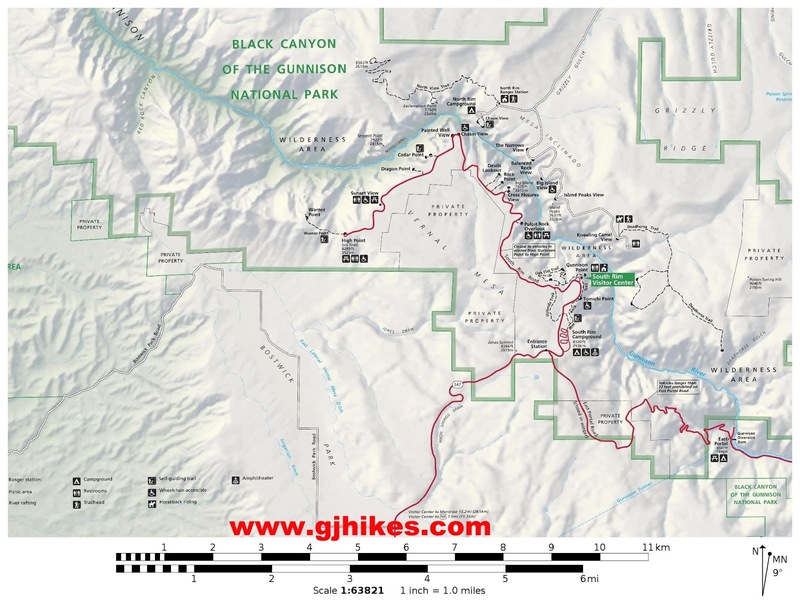 A short scramble will take you down to an area that is right on the rim of the canyon. At this point you get the feeling of being more within the canyon and part of it. Watch your step so you don't end up taking that feeling to the extreme. The turnoff to Exclamation Point comes up at the 1.5 mile point of the hike. This is as far as most hikers seem to go. Exclamation Point sits right above a bend in the canyon with dramatic views in both directions up and down the canyon. Looking up the canyon reveals the Gunnison River flowing through the canyon over 1800 feet below the rim. In the other direction the Painted Wall, which is the highest rock face in the state of Colorado, looms above the river. From Exclamation Point the trail begins climbing through the old growth forest of pinyon and juniper trees toward the summit of Green Mountain. As you can see from this photo the pinyon tree on the right is massive for a tree of its type. It would not be surprising at all if this particular tree is over 500 years old. The trail up Green Mountain never seems to get too steep. Long switchbacks make the climb a gradual process. The perspective of the canyon from Green Mountain is a dramatic change from standing on the rim. From here the Black Canyon looks more like a deep narrow gash in the surface of the earth. The canyon is at its deepest beneath Warner Point. We were hoping to get a better picture of the point but we always seemed to be peering at it over the tops of trees and could never quite catch it out in the open. From the summit of Green Mountain there are views of the West Elk Wilderness area to the east, the San Juans to the south and in this picture looking north past the boundaries of the park the canyon continues through the Gunnison Gorge National Conservation Area and Wilderness where there are many more hiking opportunities. Deer, rabbits, coyotes and an occasional bear are among the possible wildlife encounters in the park. With the stop at Exclamation Point and the hike up to Green Mountain the North Vista Loop feels like two hikes combined into one. The trail builders did a great job all the way to the end with steps in all the right places and even a rock bench to sit on near the summit. Some aspects of the trail seem to show a lack of neglect or up keep as though that same pride that went into building the trail isn't manifested in the maintenance. The North Rim Section of the park is more of a remote outpost with far fewer visitors than the South Rim. Some of the viewpoints on the North Rim though are probably the best in the park. If you would like to see it for yourself then all you have to do is 'Take a hike'.